Recommendations: The extensive GF menu includes chicken lettuce wraps, Mongolian beef, and other Asian dishes prepared in a segregated kitchen space. 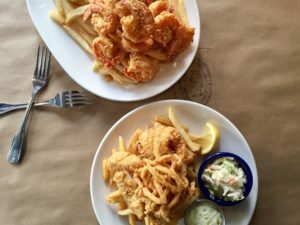 Legal C Bar: Terminal B Recommendations: All five Logan locations offer GF fresh seafood, clam chowder, and fried items like fish and chips and fried New England clams. Everything that goes in the fryer at all locations is gluten free. Recommendations: Chef Bayless’s daughter has celiac disease, so they take GF safety seriously here. Try the guacamole, salads, tortas (sans bun), or Cazuelas (scrambled eggs with roasted sweet potatoes and lots of other tasty toppings). Terminals: Concourses 1 & 3 Recommendations: All the freshly made popcorn from this Windy City staple since 1949 is GF, including the “Chicago Mix” cheese and caramel blend. Recommendations: The GF menu features fresh salads and seafood like lobster and shrimp salad, fresh oysters, and pan-seared tilapia. Recommendations: Along with breakfast, burgers, and salads, we like the sandwiches on GF bread, including the French Dip and Chicken Basil Club. Vegetarian options available. Recommendations: The huge locally sourced GF menu includes a Banh Mi Turkey burger, sweet potato waffle fries, a to-go Traveler’s Bento Box, and wicked banana cream pie with chocolate peanut butter crust and sweet whipped sour cream. Recommendations: Real low-and-slow pit barbecue among the slot machines includes Low & Slow Beef Brisket Platter, BBQ Chicken Platter, and Aunt Bee’s Veggie Platter. Recommendations: Fresh salads, aged steaks, and seafood offerings include a delish Chophouse Chicken Salad, Citrus Salmon, and cut-with-a-fork filet mignon. Along with a wide selection of GF breakfast options, get burgers, sandwiches, and pizzas with a side of rock ‘n’ roll–themed decor. The Mexican menu includes GF breakfast, fresh salads, tacos, and ceviche. 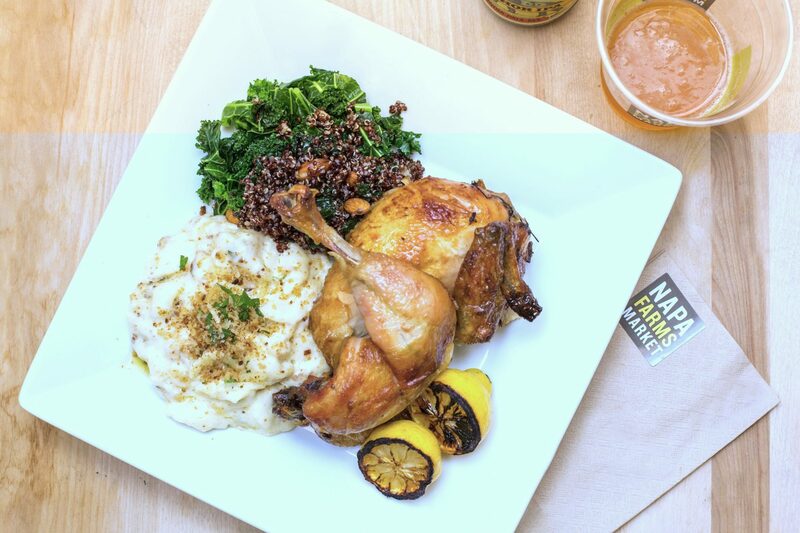 Recommendations: The GF menu includes salads, burgers, shrimp ceviche, Smoked Idaho Trout Dip, and Wood-Fired Rotisserie Chicken. All pizzas can be made gluten-free and GF salads include Thai chicken salad and tuna Niçoise. Recommendations: The signature sauce at Café Yumm! is GF, making almost all of their bowls and soups safe. You’ll find great vegetarian and vegan options, too. Recommendations: Burgers, like the Tillamook Cheeseburger, come with soft GF buns (upon request). Get an Oregon Raspberry Milkshake, too, before snapping a photo of the famous PDX carpet. Recommendations: You can pair California wines with the large GF menu’s pork tacos, Beef & Bison Chili, Burrata & Roasted Pepper Salad, or Charcuterie & Cheese plate (request sans crostini). Terminal: Terminal A Recommendations: Soups and most of the salads are GF, and there are several vegetarian and vegan options, too. Try the quinoa-and- greens-based Mediterranean Bowl with red pepper sauce. Recommendations: Burgers, fries, wraps, and salads are prepared in UFood’s healthier, never-fried style. Recommendations: Wood-fired GF pizza, roasted pork shoulder, grab- and-go salads, and rotisserie chicken are just a few of the offerings at this expansive gourmet marketplace. Terminal: Terminal 1 Recommendations: Chocolate Orange Confetti, Land of Milk and Honey, or other GF Three Twins flavors come on a GF cone by request. Recommendations: Italian-inspired favorites like Chicken Marsala, Chicken Bryan, and Prosciutto-Wrapped Pork Tenderloin accompany shrimp and scallop linguine or spaghetti pomodoro made with gluten-free pasta (upon request). Recommendations: Beloved D.C. chef Geoff Tracy offers casual American fare, including GF chicken tortilla soup, honey-Sriracha wings, sweet potato fries, and salads. Terminal: Terminal A Recommendations: All the fried items here are gluten-free, including fried oysters, buffalo popcorn shrimp, fried New England clams, and fish and chips. You can also get a lobster roll on GF bread. Everything on the menu—other than pita bread—is GF at this family-run spot, including vertically roasted chicken and beef shawarma, hummus, and salads loaded with fresh vegetables and your choice of protein.